The property as it looks in 2015. During the course of a normal working day, an employee of one of our sponsors, Countryside Estates, was made aware of the history of a property in Chesterfield Avenue, Benfleet. 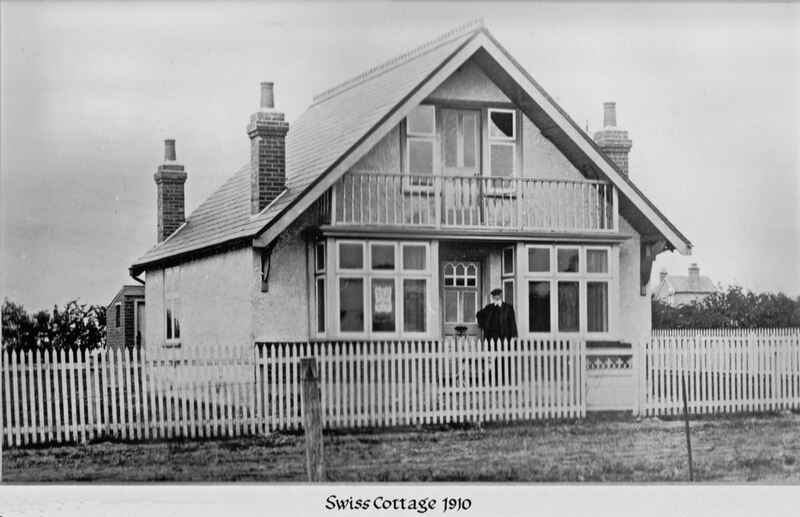 When the current owners viewed ‘Swiss Cottage’, they noticed a photograph hanging on the wall showing the property as it was at the turn of the 20th century. It appears that the photograph had been passed on as each successive owner moved in. A locally distributed magazine by the name of Select, dated 1989, published an article written by Lynn Tait, who had researched the history of the property, having obtained a postcard dated 1910 showing an elderly gentleman standing outside the front door. Heaven knows what the secret message is, but it’s there all right in this 1910 picture of a cloth-capped white-bearded gentleman on the porch of his elegant house in Chesterfield Avenue, Thundersley. There are too many strange coincidences for signs or portents not to exist. The man is Jean Alfred Dubuis, the house is known as ‘Swiss Cottage’ and the picture appears on a postcard I acquired recently. In truth it’s more advertisement than postcard because a magnifying glass reveals a Downes & Downes estate agent’s poster in the window, reading: “To be let or sold”. On the flip side M. Dubuis, the owner, who in fact lived in Finchley Road, North London, carefully drew a map showing how to get there. Price £400 freehold, six rooms, mains water, five plots of land 20 x 150ft. More land if required. The house had been built not long before this photo was taken. M. Dubuis, had caught the tide of plotland fever sweeping London. He knew that with so many East Enders seeking cheap weekend retreats relatively near to the seaside he’d have little trouble offloading the place. Naturally I went exploring – to find ‘Swiss Cottage’. It still exists. The balcony isn’t there. Gone, too, are the three chimneys. Wooden beams criss crossing the fascias give it a look more Tudor than turn-of-century. Yet, even before I saw its Swiss Cottage nameplate I recognised the slope-roofed place by its white wicket fence – or did I? When its modern owners, Peter and Valerie Field studied this picture they gasped at all the changes, but Valerie couldn’t take her eyes off that fence. M. Dubuis successfully sold ‘Swiss Cottage’ to a Mr Robert Varty on July 4, 1910, according to conveyancing documents now in possession of the Fields. A succession of owners made various changes including removal of the chimneys which the couple now hope to restore. I contacted the oldest Dubuis in London to see if she could shed more light on the old gentleman. Miss Felicie Dubuis said that her French father, Gabriel Dubuis, had died when she was young. By the time her mother had died shortly afterwards she had not taken in too much of the family history. All she knew was that her parents had arrived in England in about 1900 from the Haute Savoie district of the Swiss Alps – and there was every possibility that M. Jean Alfred Dubuis was distantly related. It also explains the choice of architectural style and name – ‘Swiss Cottage’. 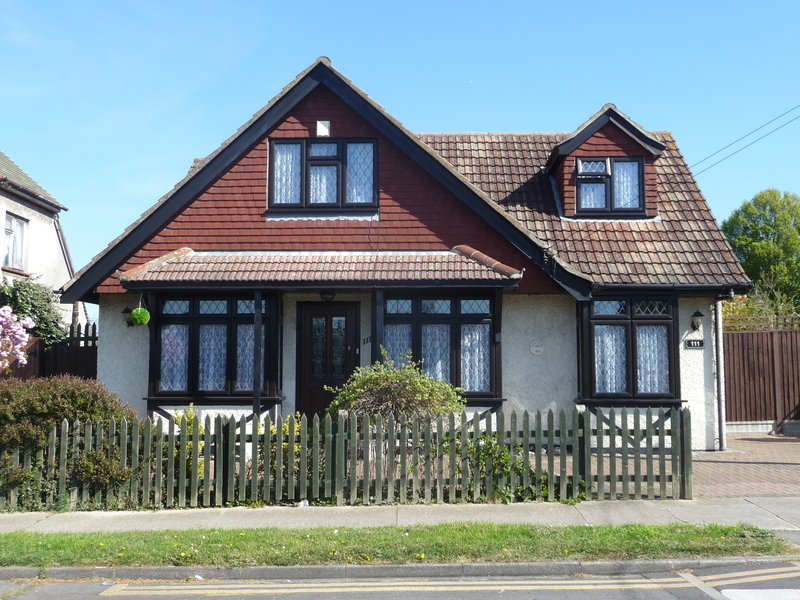 By the way, Swiss Cottage again went on to the market recently as a three bedroom house. Price £ ? – £121,995. That’s an increase of 30,000 per cent. I told you there was a message somewhere. The above article was written by Lynn Tait and appeared in Select magazine dated June 1989. We are grateful to Mr & Mrs Verlander, the current owners of this property, for bringing this article to our attention.